The exhibition considers environmental conflicts in the arctic. There is a herd of reindeer running in the colours of rag rugs, posters representing reindeer postcards, a diamond-shaped installation representing mineral exploitation, and a wolf-sculpture. 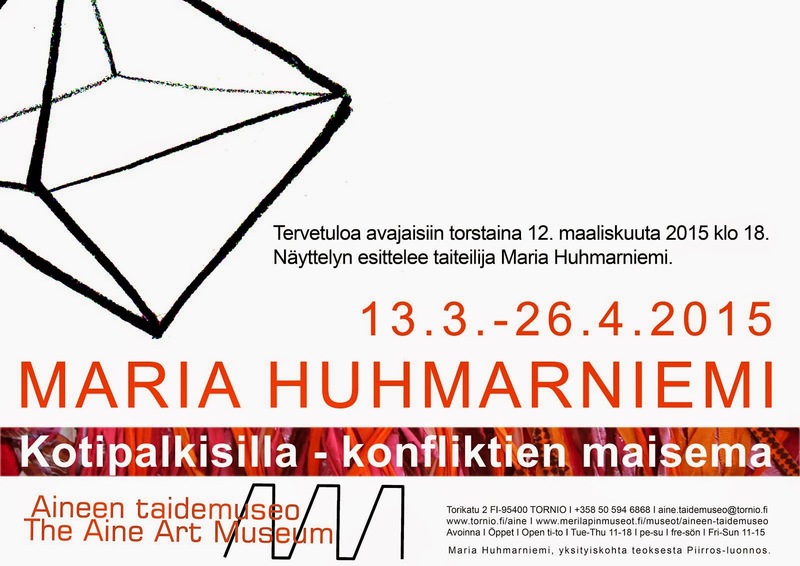 The exhibition is part of the doctoral dissertation that Maria Huhmarniemi is working for. She is studying the role of the contemporary artist as a participant in environmental discussion, and collaborating with researchers in various fields. When preparing this exhibition she has interviewed reindeer researcher Mauri Nieminen and Shamanisim researcher, Francis Joy. The rag material used in the textile sculptures underlines reindeer herding as part of Northern culture and the human influence on nature. The reindeer blend into the rugs, but the wolf hangs from them. The installation references the mining industry with a black octahedral shaped structure, typical to diamonds. There are existing diamond mines in the arctic region, and from summer 2014 diamond exploration began in Lapland. The installation aims to address the cultural sensitivities over mineral rich soil and the battle between spirituality and profit. The installation includes an audio interview with Francis Joy. He tells that in the old shamanic traditions, the mineral kingdom was inherited by ancestral spirits who have a role to play in the world just as we do. Reindeer herders can be seen as knowledge holders inherited from their ancestors. It is part of what we call the transmission and continuity of culture. Maria Huhmarniemi is an artist who engages with questions concerning the North as well as environmental issues, such as the relationship between people and nature and environmental responsibility. She makes use of old objects and textiles in her work, as well as recycled materials and audiovisual recordings and interviews. Her research focuses on contemporary value debates and conflicts relating to land use and natural resources in Finnish Lapland. The aim of this study is to ascertain how the contemporary artist may engage in these debates in collaboration with experts from different fields.